Flowers continuously from July until frost. A light pinch after flowering will result in fresh terminals 6-8 weeks later. 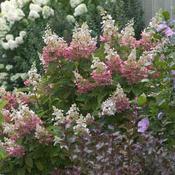 NOTE: If you hard prune after mid summer flowers will be delayed until the end of September. The large white panicles open in mid to late summer, and as summer turns to fall the florets at the base of the panicles turn pink. The flower panicles continue to grow, producing new white florets at the tip. The result is spectacular two-toned flower panicles that can reach up to 16 inches in length! Will bloom white and matures pink to red. NOTE: Even though Pinky Winky is a REBLOOMER if you hard prune in mid-summer flowers will be delayed until the end of September. Versus a light pinch which will produce flowers by early September. Try staging your crop and have 3-4 blocks pinching a block every 2 weeks.